The Klahhane Club is a long-established hiking club located in Port Angeles, Washington. Its history goes back to its inception in 1915. Its purpose is "to bring together people who enjoy, appreciate and respect the wilderness; to promote hiking, camping and related outdoor experiences; and to promote the preservation and extension of hiking trails." Club hikes are scheduled all year on Wednesdays, Saturdays, and Sundays. During Spring, Summer, and Fall seasons backpack trips are added. Club members meet at designated places, sign the "Voluntary Waiver and Release of Liability" form provided by the hike leader (a rotating responsibility), join a cost-sharing carpool to the day's trailhead, and hike at their own pace. Safety is primary with the club so the buddy system is strongly encouraged, as is being properly equipped. Hikers should be prepared for weather changes and carry with them raingear, hats, gloves, and jackets, as appropriate. Sturdy footwear is essential. Each hiker should also carry the 10+ essentials. The club meets monthly in the clubhouse for a potluck and business meeting with special speakers. To join the Klahhanes, prospective members must be at least 18 years of age. 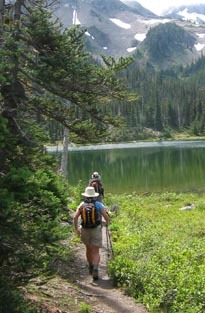 A prospective member first goes on a few "introductory" hikes. This gives all parties an opportunity to get acquainted and be assured that joining the hiking club is appropriate for them. After the introductory hikes, the prospective member notifies the Membership Chair of his or her intentions to join. An additional six "qualifying" hikes are necessary to become a Klahhane member. Prospective members must be able to participate in our day hikes of 6 to 14 miles. The health, traditions and purpose of the Klahhane Club depend on the willingness of each member to share in the responsibility of operations and participate in activities with the best interest of fellow Klahhane members in mind.